Rick up to bridge for six thirty. No contact from expected ship, and Endeavour is moving south – so we’re on for the day! How tough? Breakfast on fresh fruit, scrambled egg and bacon as we cruise the Lemaire Channel. This is great – one of my fears about being at Port Lockroy for the season was not getting to see the wonders I know are round the corner…. and here we are – what luck! Foggy views, but still special (there’s a particular someone who’ll be very envious x x x ) imagine the invisible peaks. Arrive Petermann Island for a landing at nine thirty. Meet Oceanites team who camp there during summer season; major marine wildlife researchers; v. helpful neighbours. Helen and I plod up to Adelie Towers like Teletubbies in our boil-in-the-bag immersion suits. Receive chick-counting tips at the top. Down hill past colony of cormorants, and back to ship for sauna, meeting Ian, (another Oceanites,) who’s washing his smalls in the sink. Helen and I toast, melt, shower, scrub and emerge all limp for crisp salad lunch. More Penguin Monitoring advice from John about checking for eggs; touch nesting bird on tail and she’ll lift up… Moving south now, to Vernadsky, with fresh supplies for the Ukranian station – we will be the first visitors for eight months. But the pack ice thickens to 10/10, difficult for the ship to approach close enough, treating us to a roundabout route through icy vistas and huge clearing skies. Snap away, too bright to check composition. Heart full. Captain tries hard to find a landing site. Two hundred cormorants lift off the water, fly, swoop and land again as one. Eventually one zodiac is able to deliver fresh food, at the cost of one propeller. The sun is so strong, and we so unprepared (no sunnies, no sun-cream,) that shade and bed beckon. Find Tudor and Helen crashed out in OUR loaned cabin, wake them up and take their places – hot bunking! Helen goes for zodiac cruise, Tudor checks e-mails, Rick and I sleep. 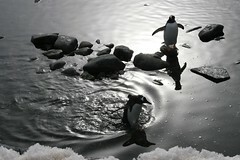 Recap session v. entertaining, especially Stefan’s rendition of female adelie penguin’s infidelity. Such positive vibes on this ship – I like a captain who throws snowballs. Sit together for our final dinner as a team (Tudor will stay on the ship, until Ushuaia, once we are dropped off, he has lost his appetite.) Out on the monkey deck to appreciate return sail through Lemaire Channel. A sickle moon slithers behind the peaks, which can be seen this time. I’m remembering last year, on the bridge of HMS Endurance, peering up to the heights. What a lot has happened since then, and what luck to be here in awe again. The sea opens out. Our Mount William is visible up ahead. It’s late; the passengers and light are fading. At the library tea bar, an Alaskan lady insists on cramming luxury tea bags in our pockets (Mint Melange, Bombay Chai, etc.) and giving us water bottles and hotel toiletries. A gentleman (who’s wife had lent me several layers, hat, scarf, gloves on deck) presses half a bottle of JD that he’s sure not to need in Drake’s Passage. Quiet cuppa in leather armchair, and then along to the bridge where the others are waiting sombre. Tim laughs at our interactions (altercations?!) – he’ll be observing our progress regularly, from now ’til Christmas. He takes us to the bar for a strong, short hot toddy. Rope ladder hop into zodiac, into nondescript night sea. Several inches of fresh snow. Relief that front door hadn’t blown open. Action stations with no light! Tudor has forty-five minutes to pack and return to ship. Money must be bundled and credit card slips tallied for him to take. He’s promised to post cd of images for blog…I have ten minutes to burn it argh panic. Bud the zodiac driver waits patiently in the cold dark bunkroom as we flap about. Finally all that can be pulled together is and we are standing at the landing site, hugging goodbye and thanks. We’ll miss him, and envy his passage on the Endeavour. Catch his waving arm, silhouetted against the ship’s beam, on camera. A last moment. The illuminated vessel slides decorously out of sight. Brutal to climb into bed in unheated hut. We’ll have to reacclimatise after comfort of ship. Physical and emotional need for a hot water bottle. Takes a long while to fall asleep.